Did I mention that I LOVE surprises? 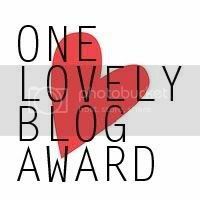 Boy, was I surprised today to find out that Uduak of Finally Me had passed on the ‘One Lovely Blog Award’ to me! *Does a little “komole-ing,” gives Jesus a wiper and quickly decides against doing a “split” for obvious reasons … Oush! 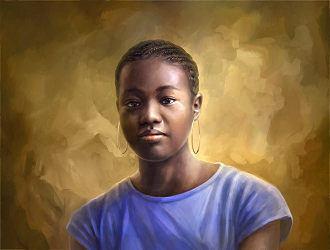 * Thank you so much, Uduak! I am truly grateful. Please check out her blog (if you have not already done so) HERE. You will not regret it. *Takes in a deep breath* … Here we go! Hmmm … I actually don’t have one, but I really like fuschia and blue (not necessarily together, but that’ll work too). Ha! This one is easy – Strawberry Cheesecake. (jokingly): White, because I am an ANGEL (polishes halo and puts on her best “I am an angel” face) … LOL! Seriously, I prefer Black because it goes with just about anything. You cannot go wrong with black. People talk about the “little black dress,” not the “little white dress.” I rest my case. Come on! I am not going to reveal that here. Okay, I will be a good sport and this is my answer: not fulfilling my purpose in life, i.e. what God created me to do. I enjoy watching cartoons. I don’t think I will ever outgrow them. As promised, please see below two versions of Kauna Allah. I will post more details on Jeremiah Gyang later. And that’s all folks. I actually enjoyed doing this. Have a great week y’all! Congrats on your award. I love cartoons too, and wear glasses. Didn't know you were a twin, are you both identical? Thank you so much! You love cartoons too? And wear glasses? I would never have guessed! LOL! Thanks for awarding me this. I should get around to doing it soon. Let's see you eyes naa, lol. You have a twin??????? waoooooo. Thanks for the tag :) me love u long time! Good to know some things about you | u r a twin? I look forward to seeing ur pics (keen to see the small eyes...) haha | Whats your height? You're very welcome! I look forward to reading your entry. If I show you my eyes, I won't be anonymous again na....LOL! Yes, I have a twin o and she's like me (and unlike me) in many ways. You're very welcome and "Awwwww" (plus blushes) at the love! I appreciate it. You're are so welcome, LDP! Yes, I am a twin, but we are not identical sha (Thank God). Pictures ke? Emmmm, I will draw a stick figure with tiny eyes and post it nigbayen! LOL! My height? Let's just say I am taller than a regular-sized acoustic guitar (how unhelpful. I know). I am glad you liked the song. It's a classic to me. I don't think I can get tired of listening to it. Hi, arent we all surprised to know that you are a twin?? thanks so much for passing the award to me. I will be sure to do it justice and pass it on. You're very welcome, as per the award. I'll be on the lookout for your entry. You're welcome again, Barbara. My pleasure! Hey! thank you so much for the award! As I haven't even had the chance to go on my own blog recently (even with all the plans I had!) I don't know when I will get the chance to do what I need to do. But I will, I promise! Gracias,the ever Relentless one.I picture you now sitting cross legged on a couch with a plate adorned with strawberry cheesecake on your laps peering through your glasses at those cartoon characters,having a good laugh and just enjoying life. *winks*.Thanks again pal for passing this award to moi.Gracias. Senorita. *grinning from ear to ear* You're very welcome, Amanda. I must say I was quite impressed at how you nicely crafted a simple paragraph with some of the things I said about myself in this post. I am still smiling sef .... Very creative! Thanks for visiting my blog too! LOL @ you being a third twin. I would have preferred "Blog twin" but this one'll work too. You wear glasses? (I didn't see that one coming) But I already knew about the dogs and cheesecake (stomach growls) thanks to your other blog. LOL @ your "many" awesome features. Someone is tooting her own horn, isn't she? (grins) .. It's allowed! As for the well-dressed bobo, I see that you also appreciate the "finer" things in life (wink) ... LOL! I am glad you liked the song.